Coming in May 2013 from University of Massachusetts Press. From the UMass catalog: In “The Wired City,” Dan Kennedy tells the story of the New Haven Independent, a nonprofit community website in Connecticut that is at the leading edge of reinventing local journalism. Through close attention to city government, schools and neighborhoods, and through an ongoing conversation with its readers, the Independent’s small staff of journalists has created a promising model of how to provide members of the public with the information they need in a self-governing society. Although the Independent is the principal subject of “The Wired City,” Kennedy examines a number of other online news projects as well, including nonprofit organizations such as Voice of San Diego and the Connecticut Mirror and for-profit ventures such as The Batavian, Baristanet, and CT News Junkie. Where legacy media such as major city newspapers are cutting back on coverage, entrepreneurs are now moving in to fill at least some of the vacuum. 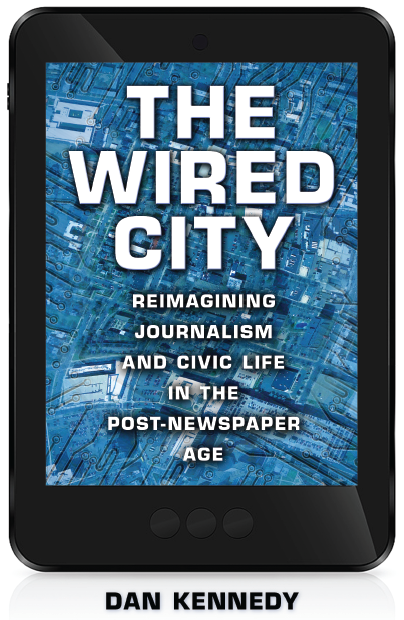 “The Wired City” includes the perspectives of journalists, activists, and civic leaders who are actively re-envisioning how journalism can be meaningful in a hyperconnected age of abundant news sources. Kennedy provides deeper context by analyzing the decline of the newspaper industry in recent years and, in the case of those sites choosing such a path, the uneasy relationship between nonprofit status and the First Amendment. At a time of pessimism over the future of journalism, “The Wired City” offers hope. What Kennedy documents is not the death of journalism but rather the uncertain and sometimes painful early stages of rebirth. About the author: Dan Kennedy is an assistant professor of journalism at Northeastern University in Boston and a nationally known media commentator who writes for the Nieman Journalism Lab, The Huffington Post and other publications. He is a panelist on “Beat the Press,” an award-winning weekly media roundtable on WGBH-TV (Channel 2). A former media columnist for The Guardian and The Boston Phoenix, he is a past winner of the National Press Club’s Arthur Rowse Award for Press Criticism. His first book, “Little People: Learning to See the World Through My Daughter’s Eyes” (Rodale, 2003), is a critically acclaimed memoir about raising a daughter with dwarfism. His full biography is available on his blog, Media Nation. Photo of New Haven at night (cc) by Matt Krause and published under a Creative Commons license. Some rights reserved.